As late as the 1970s, most paleontologists agreed that dinosaur tracks, while certainly interesting, had only minimal scientific value. But today, the study and interpretation of tracks is the basis of dinosaur ichnology, a subscience of paleontology that is providing an unprecedented understanding of the behavior of dinosaurs and the environment in which they lived—insights that cannot be gleaned from the study of fossilized bones. Dinosaur ichnology — the word “ichnology” stems from the Greek ichnos, meaning “footprint” or “track” — is the study and interpretation of dinosaur tracks and traces. Unlike bone fossils, trace fossils are records of the movement and behavior of ancient animals. Along with tracks, trace fossils include the remains of burrows, dens, feeding tunnels, nests, tooth and claw marks, tail-drag marks, and other features that were formed by living animals. Paleontologists have documented more than 1,500 dinosaur-track sites worldwide and are finding more each year. Track sites or trackways, defined as a sequence of two or more tracks made by the same dinosaur, have been found on every continent except Antarctica. While some sites have only a few tracks, others have hundreds or even thousands. Collectively, these trackways represent 190 million years of geologic time, from the dawn of the dinosaurs 255 million years ago to their sudden demise 65 million years ago. 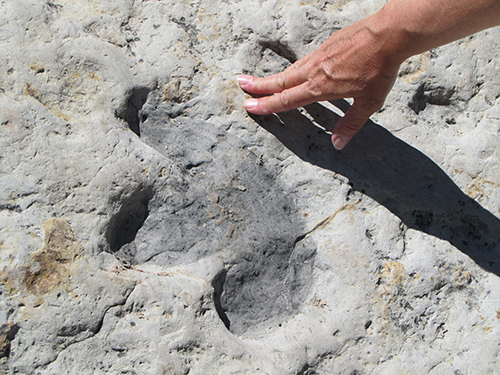 Dinosaur tracks were first documented more than two centuries ago. Although poorly understood at the time, they nevertheless intrigued both scientists and the public. But they later lapsed into a century-long period of obscurity from which they have only recently emerged. Today, paleontologists and the general public are as interested in dinosaur tracks as they are in dinosaur bones. Dinosaur tracks and trackways can be seen in many natural-history museums and at more than 100 in situ track sites on public lands, several of which have been developed into educational public attractions. After a dinosaur trackway was recently discovered in China’s Sichuan Province, anthropologists learned that the ancestors of the indigenous Yi people believed that the tracks were those of the heavenly steed of their hero-creator Zhigealu. In the African nation of Lesotho, ancient Bushmen cave paintings depict bipedal-dinosaur-like creatures that are apparently based on observations of nearby dinosaur tracks and fossils. And in the American West, it is not coincidental that Native American petroglyphs appear alongside several dinosaur track sites. A 12-year-old farm boy named Pliny Moody is credited with the discovery of dinosaur tracks in the United States. 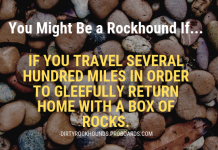 In 1802, he found “stony tracks” along the Connecticut River near South Hadley, Massachusetts. A local doctor declared the turkey-sized, three-toed tracks to be those of “Noah’s raven,” the biblical, post-deluge bird that Noah dispatched from the ark to find land. He died in 1864 still believing, like some of his New England academic peers, that the tracks were those of ancient birds. 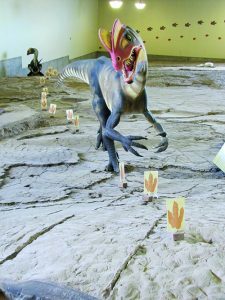 A life-sized recreation of a theropod dinosaur “walks” along an in situ, 60-foot-long trackway at the St. George Dinosaur Discovery Site at Johnson Farm in St. George, Utah. and Wyoming began excavating and mounting nearly complete, fossilized skeletons of huge dinosaurs. For the next century, attention focused on dinosaur bones, not dinosaur tracks. In 1908, paleontologists documented a large track site at Glen Rose, Texas; in the 1930s, they found another at Morrison, Colorado. Yet despite these new discoveries, few paleontologists seriously studied tracks. Public and scientific interest in dinosaurs suddenly took off in the 1970s as radical, new dinosaur theories regarding warm-bloodedness and behavior displaced traditional ideas. Meanwhile, a host of dinosaur-related publications, led by best-sellers like Adrian Desmond’s "The Hot-Blooded Dinosaurs" and Robert Bakker’s "The Dinosaur Heresies" became best sellers. By 1970, the track site at the newly established Dinosaur State Park at Rocky Hill, Connecticut, was drawing big crowds. Dinosaur Track State Park at Glen Rose, Texas, opened in 1972; and by 1976, Dinosaur Ridge at Morrison, Colorado, had become a regional attraction. Dr. Martin Lockley, now professor emeritus at the University of Colorado at Denver, was among the paleontologists who led the effort to turn dinosaur ichnology into a valid subscience. Lockley amassed a large track collection for the university, directed the development of Dinosaur Ridge as an educational attraction, and wrote numerous articles about dinosaur ichnology aimed at the general public. In 1986, dinosaur ichnology gained full recognition as a subscience of paleontology when the First International Symposium on Dinosaur Tracks and Traces, held in Albuquerque, New Mexico, brought together dinosaur ichnologists from all over the world. Dinosaur tracks were once considered somewhat rare. But now, with both paleontologists and the public searching for them, they proved to be rather abundant. As paleontologists point out, a dinosaur leaves one skeleton, but makes millions of tracks. Of course, few of these tracks survive. Considering the precise sequence of environmental and geological conditions necessary for their preservation, it is remarkable that any survive at all. Dinosaur-track preservation began with the proper consistency of the sediments—the mud—in which the track was made. 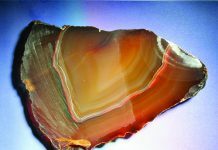 Consistency is determined by water content and the composition and size of the sedimentary particles. The mud had to be just moist and thick enough to have a plastic consistency capable of retaining the track impression. 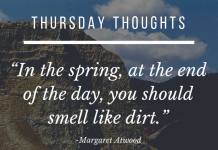 If it was too wet, the impression quickly lost its shape, filled in, and was lost; if the mud was too dry, the impression was indistinct and barely noticeable. 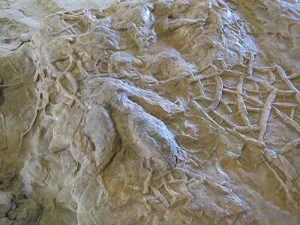 10-inch cast of a bipedal, carnivorous-dinosaur track is preserved along with adjacent mud-crack casts. 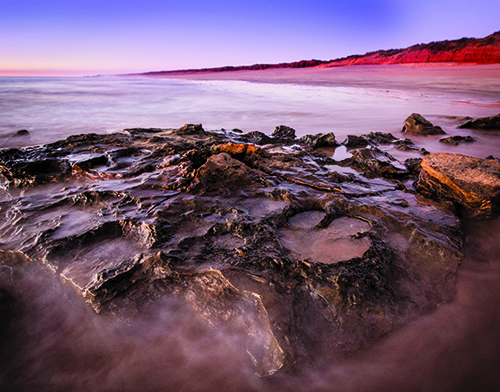 Most dinosaur tracks that became preserved were made in tidal mudflats where water levels regularly rose and receded. Warm, relatively dry air was needed to harden the mud sufficiently to quickly “set” the impression before it was immersed in rising water and accompanying secondary sediments. It was critical that these secondary sediments differed somewhat in composition from those of the original track layer. Next, over a prolonged period of time, the entire track-bearing mudflat had to be buried deeply enough to generate sufficient heat and pressure to lithify the unconsolidated sediments into layers of solid sandstone. Finally, millions of years later, erosion had to uncover the track layer in a manner that slowly exposed, but did not destroy, the fossilized tracks. Fossilized dinosaurs tracks are either molds or casts. Molds or “positives” are the concave forms of the original track impressions. The secondary sediments that filled these impressions formed casts or “negatives” which, when fossilized, appear as inverted, convex replicas of the bottom of dinosaur feet. Because of the compositional difference in the mold and cast sediments, sandstone sometimes separates cleanly at the boundary of the two strata, leaving one surface with molds and the other with casts of the same track. The combination of proper mud consistency, fine-grained sediments, and near-perfect preservation conditions can produce detailed, fossilized tracks that replicate the size and shape of the dinosaur’s foot and even its basic physiological features. These tracks reveal such anatomical details as the pad and muscle structure, the degree of digital flexibility, nature of the claws, and even skin patterns—none of which can be gleaned from bone fossils. Dinosaur tracks are identified by ichnotaxa names or “track names.” These are not the same as the zoological taxonomic names of the actual track-making dinosaurs. Ichnotaxa names are based on track shape and detail, while zoological names are based on measurements and characteristics of fossilized bones and teeth. Track names are necessary because paleontologists cannot confirm that a member of a specific dinosaur genus made any particular track. Track names often end in “-pus” or “-podus,” which stem from the Greek pod, meaning “foot.” As an example, tracks that were likely—but not positively—made by Tyrannosaurus are named Tyrannosauripus. Dinosaur tracks provide clues about such behavioral traits as herding tendencies, and have indicated that many large herbivores and small carnivores traveled in herds, and that adults often traveled apart from juveniles. Trackways show whether a dinosaur was walking, running, trotting, or wading, and if it traveled in a bipedal (two-legged) or quadrupedal (four-legged) manner, or perhaps alternated between these modes. The size and spacing of individual tracks within trackways enable paleontologists to accurately gauge the speed at which the dinosaurs moved. Until the 1970s, most dinosaurs were thought to drag their tails. But trackway studies show that dinosaurs dragged their tails rather infrequently, even while walking in the sprawling, semi-erect gait seen in some modern reptiles. At many public tracksites, tracks are colored with a charcoal “paint” to enhance their visibility. sediments by dinosaurs. As large dinosaurs compressed sediments and other materials beneath their feet, they helped to preserve small life-forms that might not otherwise have become fossilized. Dinosaur-track sandstone is often a fossil record of the small plant and animal life-forms that existed at that time. Tracks and their adjacent sandstone layers even provide information on water depth, current direction, surface gradient, and water content of sediments at the moment the tracks were made. Because tracks were sometimes preserved in areas where bones did not fossilize, ichnology paints a fuller picture of the geographic distribution of dinosaur genera. Just as individual tracks link together to form trackways, paleontologists now link individual trackways into “megatrackways.” The three megatrackways in the western United States are the Upper Glen Rose in Texas, the Salt Valley in Utah, and the Dinosaur Freeway in Colorado. Each is a record of regional dinosaur movements that support the theory that certain dinosaurs migrated hundreds of miles. Colorado’s Dinosaur Freeway consists of 20 individual trackways over a distance of 40 miles, each made by the same types of dinosaurs in the same 100-million-year-old, Cretaceous geologic horizon. The Dinosaur Freeway marks the western shore of the Cretaceous Interior Seaway, an inland sea with a broad coastal plain that hosted a booming dinosaur population. Using collective data derived from the various Dinosaur Freeway track sites, paleontologists can estimate dinosaur populations, ratios of carnivores to herbivores, and ratios of large-to-small track-makers. In paleopathology, the study of wounded or malformed dinosaurs, tracks reveal how dinosaurs compensated for abnormalities by modifying their manner of locomotion, for example, limping. Dinosaurs walked in either a bipedal (two-legged) or quadrupedal (four-legged) manner, with some genera alternating between these two modes like certain modern lizards. Bipedal tracks, the most common, consist of sequences of similarly shaped, three-toed prints called “three-toed” or tridactyl tracks. Both carnivorous theropods and herbivorous ornithopods made bipedal tracks. Long, narrow theropod tracks are terminated with slender claw marks; ornithopod tracks are rounder with blunt digit marks. The less common quadrupedal tracks, such as those of large sauropods, are generally dish-shaped with four or five stubby digits. Paleontologists at the Morrison (Colorado) Natural History Museum recently discovered the tracks of 148-million-year-old, juvenile sauropods, long-necked, herbivores that include the ponderous Camarasaurus and Apatosaurus. These juvenile tracks are of hind feet only and their spacing is much greater than would be expected for slow-moving sauropods. These tracks, the first ever found of running sauropods, show that baby sauropods ran much like modern basilisk lizards, quadrupeds that run on their hind legs only when disturbed. There are many places to see, study, and photograph dinosaur tracks in the United States. The Beneski Museum of Natural History at Amherst College in Amherst, Massachusetts, displays the historic Hitchcock Ichnology Collection. Assembled by Professor Edward Hitchcock in the 1830s and 1840s, it includes 1,100 sandstone slabs with thousands of tracks from the Connecticut River Valley. Among them is the “Noah’s raven” slab found in 1802 by 12-year-old Pliny Moody. Visitors to the nearby Dinosaur Footprints Reservation at Holyoke, Massachusetts, can see 130 tracks in 190-million-year old, Jurassic sandstone along the Connecticut River. These tracks are those of groups of 10-foot-tall, bipedal theropods. This track site, the first ever scientifically described, gave rise to the idea that dinosaurs traveled in groups. At Dinosaur State Park at Rocky Hill, Connecticut, a geodesic-dome Exhibit Center has excellent educational displays, dinosaur murals, and 500 in situ tracks of carnivorous Jurassic dinosaurs. The track site was discovered in the 1960s during excavation for a new state building. This large block of sandstone has split along the track layer; concave track molds of “positives” appear on the top section, convex track casts of “negatives” appear on the bottom. Dinosaur Ridge at Morrison, Colorado, just west of Denver, is a tilted “hogback” ridge of 100-million-year-old Dakota Sandstone with 300 dinosaur tracks. 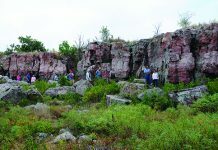 Dinosaur Ridge, where Dr. Martin Lockley did much of his pioneering work in dinosaur ichnology, has a 1.1-mile paved walk with interpretive signage, public tours, two visitor centers, and dinosaur-bone quarries that date to the late 1870s. Dinosaur Ridge is part of the Dinosaur Freeway megatracksite. The nearby Morrison Natural History Museum is an active paleontological laboratory where exhibits include tracks of baby dinosaurs. Southeast Colorado’s remote Picketwire Canyonlands Track Site, located on the Purgatoire River south of La Junta in Comanche National Grassland, is administered by the U. S. Forest Service. 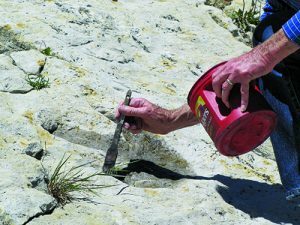 More than 1,500 individual tracks appear in 100 separate trackways in the 150-million-year-old Morrison Formation limestone. Most were made by dinosaurs similar to the giant herbivore Apatosaurus and the large carnivore Allosaurus. The track site at 1,587-acre Dinosaur Valley State Park at Glen Rose, Texas has hundreds of tracks of three-toed theropods and giant sauropods in exposures of the 113-million-year-old Glen Rose limestone along the Paluxy River. 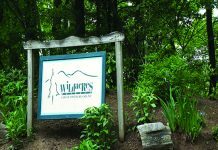 The park has an interpretive center, 20 miles of trails, and five major track sites. At Clayton Lake State Park near Clayton in northeastern New Mexico, 500 tracks of three dinosaur genera, mostly bipedal ornithopods, appear in the 100-million-year-old Dakota Sandstone. The park has interpretive signage and an elevated observation walkway. 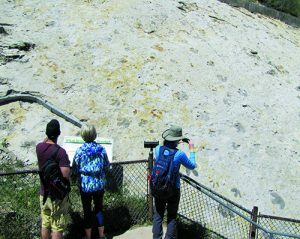 The Red Gulch Dinosaur Tracksite near Greybull, Wyoming, discovered in 1997, has interpretive signage and an observation walkway that overlooks several hundred tracks in the Sundance Formation limestone. Red Gulch is one of the few track sites that represent the mid-Jurassic Period 170 million years ago. 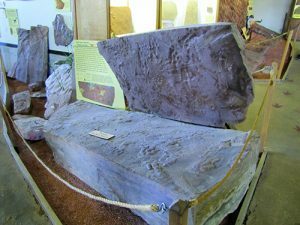 The St. George Dinosaur Discovery Site at Johnson Farm in St. George, Utah, showcases 4,000 tracks on two stratigraphic levels of the 200-million-year-old Moenave sandstone. Local optometrist Dr. Sheldon Johnson discovered the track site on his farm in 2000 and donated the land to the city of St. George for development as an educational attraction. This site has an excellent museum and welcomes more than 200,000 visitors each year. The Moab, Utah, area has a half-dozen track sites in 100-million-year-old sandstone on land administered by the Bureau of Land Management. The Copper Ridge Sauropod Dinosaur Trackway has both sauropod and theropod tracks, including those of a large sauropod that was turning and those of a limping theropod. Other nearby track sites are the Potash Road Dinosaur Trail and the recently discovered Dinosaur Stomping Ground Trackway, both with tracks representing ten different kinds of dinosaurs. In Moab, the Museum of Moab and the Moab Giants attraction have outstanding dinosaur-track-related exhibits. Dinosaur ichnology has come a long way in a short time and now complements the traditional study of bone fossils. Together, studies of tracks and bones are giving us our best understanding ever of dinosaurs. A typical ornithopod track is rounded with blunt digits. 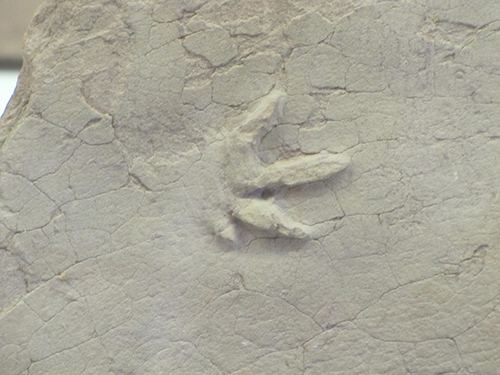 A particularly rare track is this four-inch cast of the hand impression of a small, bipedal theropod dinosaur.